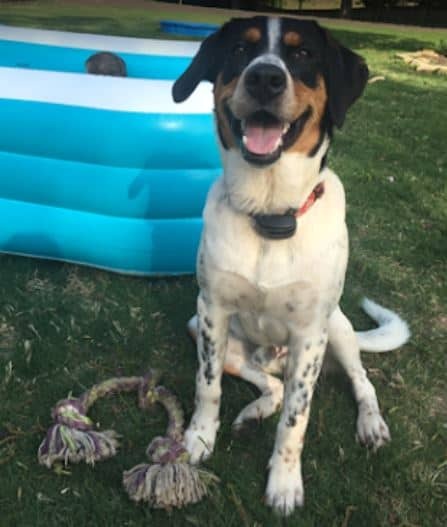 Waffles is a male Australian Shepherd Bernese Mountain Dog mix for adoption to a very loving home in or near Fisherville, TN, close to Memphis. 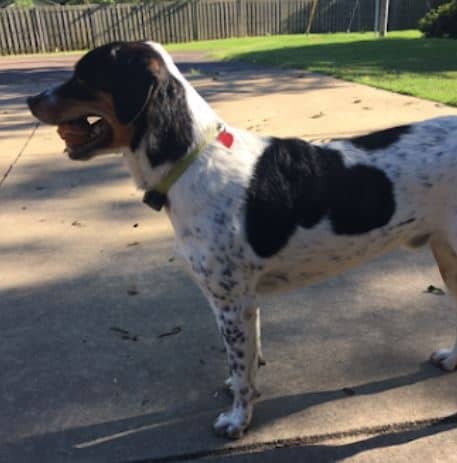 This very healthy young dog is 2 years old and weighs 65 pounds. He is fixed, up to date on shots and house broken. Questions about Waffles? 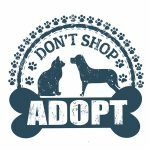 Contact our Memphis Dog rehoming team today. Text “Waffles” to (888) 833-2128 or email Waffles@Dog-lover.us. We look forward to hearing from you. Adopt this sweet Australian Shepherd Bernese Mountain Dog mix in Fisherville TN today. Waffles is a fetch-a-holic and can jump really high. Watch! Waffles is an amazing 2 year old mix of Bernese Mountain Dog and Australian Shepherd for adoption to a loving home in or near Fisherville TN, close to Memphis. He is fixed,, up to date on shots, house trained and well behaved. Waffles loves children, and they love him. He is usually good with other dogs, and is looking for a very loving home with people who have a securely fenced yard, and lots of time to spend with him. Adopt Waffles today! Yes, I am always THIS happy! Accessories Included: Balls, collar, and kennel. Busy! I have twin 4 year old boys. 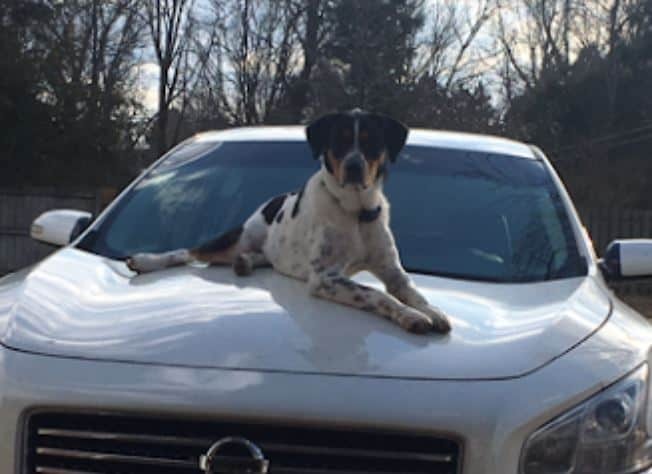 We have a 3 year old, female Labrador/Great Dane and a 5 year old, male Jack Russell Terrier/ bird dog. The 2 male dogs do not get along. Waffles likes the other dog but the small dog is very aggressive towards Waffles. Waffles didn’t do anything to him until he had enough and defended himself and blood was everywhere. I have to keep them separated and it is hard to do. Either Waffles is outside or inside in his kennel or the small dog is outside or in his kennel when Waffles is out in the house. It’s not fair to them! Especially Waffles as he is very active!!! I have a 23 year old daughter and twin 4 year old boys. Waffles’s Favorite Toys, Foods, Activities? Tennis ball toy and a rope for tug of war !! He love playing ball CONSTANTLY. very high activity and I just can’t give him the attention he needs. He loves water!!! We use to take him to the pond and throw the ball or sticks in and he always brings them back! Literally all he loves is ball!!! One track mind! Why is Waffles Being Rehomed? He is too active for us and he and my other male dog do not get along and I do not want fighting in the home! Ideally someone with a lot of land for him to run and play ball and enjoy the water. He is very trainable!! He know sit and shake and kisses! Someone who can devote a lot of activity for him. I am allowed up here, don’t worry! If you are interested in adopting this special Australian Shepherd/Bernese Mountain Dog Dog For private rehoming in Fisherville TN, please fill out our online meeting request below. Once received and reviewed, our staff will ask the pets owner to reach out to you and arrange a meeting. Questions about Waffles? Contact our Australian Shepherd/Bernese Mountain Dog rehoming team today. Text “Waffles” to (888) 833-2128 or email Waffles@Dog-lover.us. We look forward to hearing from you.